1000 sqft, 2 bedroom, full kitchen, tub and shower, waterview patio with BBQ! Take a step back in time and relax in this spacious 2 bedroom half-duplex. Frank and Alison have completely renovated your future home-away-from-home yet retained the character of their sixties style home to create a comfortable 'homey' experience that feels new yet familiar. Set on over half an acre Royston Seaview Suite is a nature lover's paradise! 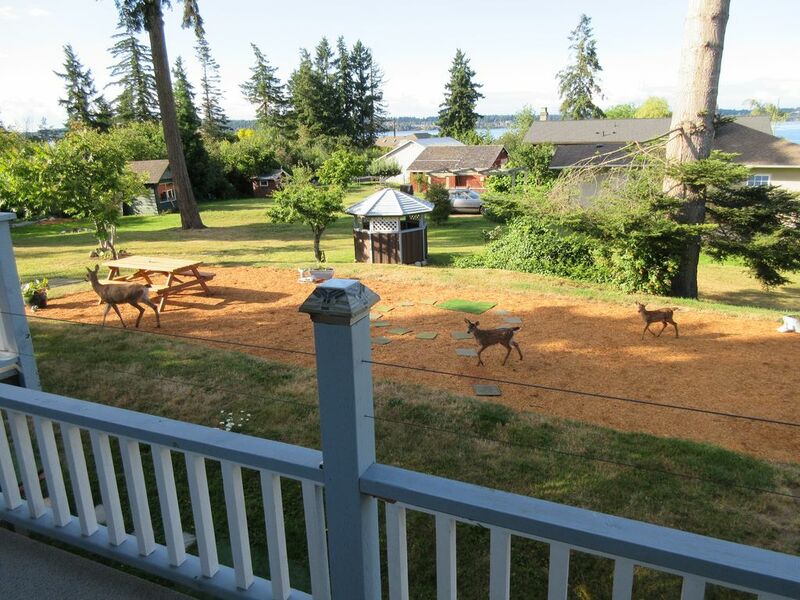 Deer, rabbits, raccoons, and an amazing array of birds, including eagles, herons, gulls, jays, and hummingbirds, are regular local visitors to Royston Seaview Suite! Royston is a wonderful destination in the Comox Valley where you can feel 'away from it all' but close to everything! The Royston Seaside Trail and beach are just down the street, Courtenay is 5 KM away and the Comox Airport is a 15 minute drive.Your Hosts Frank and Alison Zitelmann have lived in the lovely little hamlet of Royston for 9 years and have loved every minute of living in this vibrant yet peaceful community. Royston Seaview Suite is not only steps from the Royston beach, parks, trails, a pub and restaurant, a local coffee roasting house, and the world class Kingfisher Spa it is also in a wonderful central location on Vancouver Island! Majestic waterfalls, old growth Douglas Firs, pristine lakes, fabulous beaches, quaint towns and villages, marvelous markets, secluded islands and inlets, and much more are all within a short drive of our quiet but convenient Hamlet of Royston. See YOU at Seaview soon! Frank was born with a song in his heart and a bounce in his step. He groomed dogs in Victoria for 25 years as the proprietor of Fairfield Grooming by day and played in a band called 'The Legends of Langford' by night. Frank and Alison met while out dancing at Swans in Victoria and it was love at first sight! Alison raised three amazing children in Victoria while earning her Bachelor of Science Degree majoring in Psychology at UVic. After her youngest went off to Thompson Rivers University in Kamloops, Alison and Frank moved to the hamlet of Royston. They love living here so much that they got married at the beach and have been 'dancing by the light of the moon' ever since! With a common interest in travel, the two have gone on extensive tours of BC, the USA, Europe, and recently, Southeast Asia and have loved every minute of it! They have met wonderful people from around the world and are excited to invite you to their home! Just 5 houses from the beach! View of the spectacular Baynes Sound.. Smoking allowed in Patio Area ONLY. NOT in suite. ston Seaview Suite is not only steps from the Royston beach, parks, trails, a pub and restaurant, a local coffee roasting house, and the world class Kingfisher Spa it is also in a wonderful central location on Vancouver Island! Majestic waterfalls, old growth Douglas Firs, pristine lakes, fabulous beaches, quaint towns and villages, marvelous markets, secluded islands and inlets, and much more are all within a short drive of our quiet but convenient Hamlet of Royston.